like it would. I had the Sawyer adaptor for some time and I think it took a couple of weeks to get here. The Sawyer adaptor kit is to connect the Sawyer filter in line with your hydration pack. The Camelback quick connect is to click in either the inline adadptor for filling or your bite valve for drinking. I ordered the above kit as shown through Amazon, Hopefully will turn up in time for my trip. Fingers Crossed. I can just imagine walking on a trail somewhere, coming by some water, all I do is gather some water with my Evernew 1.5L bag and attach to my mouth piece, squeeze the water into my bladder inside my pack, while wearing the pack. I couldn't resist this upgrade, Have to do it. My other method was to stop, take pack of, somehow drag the bladder out of pack, filter water than somehow get that bladder back in my pack and put my pack back on and start walking. I think I know which method I would have preferred. I had to order. My hydrolink filter adapter just arrived and I've just constructed it all. Looks like this is going to be a good setup! 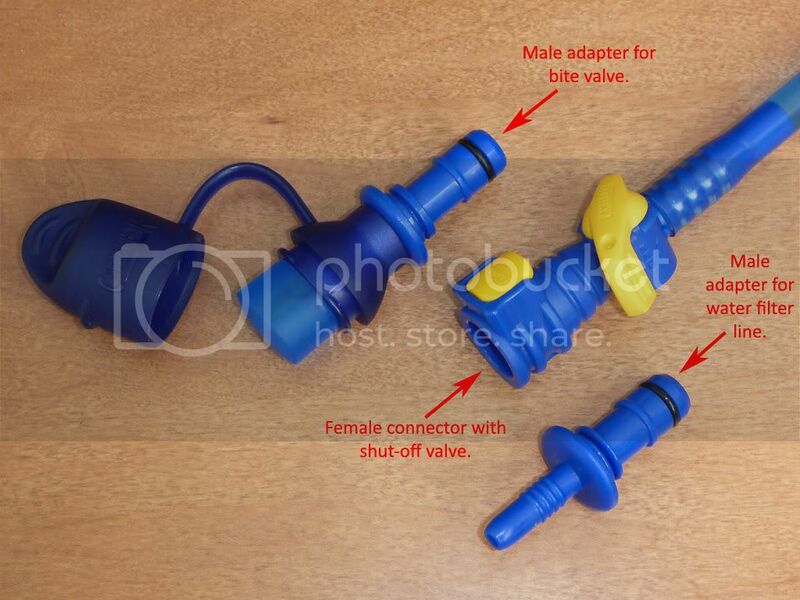 If it doesn't arrive in time you can still pull off the bite valve and attach the inline adapter directly to the hydration tube, for the meantime. Strider wrote: My hydrolink filter adapter just arrived and I've just constructed it all. Looks like this is going to be a good setup! Why do people persist with camelbacks? Rob A wrote: Why do people persist with camelbacks? I find bladders a good way to carry a large quantity of water. What's the downside in your experience? No as I'm still waiting on some other bits! What else should I be using Rob? I've used mine it is easy and works perfectly, I just need to be mindful of where any drips or spills from the "contaminated" water go. I always cover or remove and seal the filtered water bits in a ziplock before disconnecting and packing away the "contaminated" water bits. Another good thing is my bite valve has a tap on it and so does the Camelback hydrolink. I'm not losing any water by accident here except in a total brain fade. neilmny wrote: Another good thing is my bite valve has a tap on it and so does the Camelback hydrolink. I figured that was too much of a pain in the bum and put my bite valve directly on the hydrolink fitting. But I might decide I want the elbow back in it once I've actually used it. I thought about that too but decided that the tap on the hydralink was also insurance against letting air back into the system. squeezed from the bag (if any). it being injected into the hydration pack. Air in the hydration pack as it builds in volume each time I refill is taking valuable water space. The air will compress to some extent but still takes valuable space. But what you've described has nothing to do with having the extra tap on the bite valve? Strider wrote: But what you've described has nothing to do with having the extra tap on the bite valve? Good points. The tap is an integral part of my bite valve so I'd need a different bite valve to change it. The bite valve should be removable from the plastic its attached to. And should just slide over the wider of the two hydrolink adapters. It's not a Camelback bite valve, some other brand I can't recall. The yellow bit is the tap. What they said is .. Compared to the Evernew bladders they are slightly lighter, we think slightly tougher and for sure far less expensive. Not sure I would describe that statement as being "astonishing claims" and whilst they are suggesting they are better, they are hardly going over board in their suggestion. After all they are only suggesting that they are slightly tougher and lighter. I guess field use will determine if they are better or not, but at least Sawyer seem to have recognised at last that they had a problem. Regardless of how they are saying it, it is a big claim to be making. Particularly in light of the tried and proven Evernew bags. I remain skeptical. MLD can do cheaper shipping than their standard option for small items like this. Picked up a Squeeze and some gaiters a couple of weeks ago. My setup has arrived and it works a treat, in the past week i have not had to remove my water bladder from my pack. Strider wrote: Regardless of how they are saying it, it is a big claim to be making. Particularly in light of the tried and proven Evernew bags. I remain skeptical. Having now handled both the new Sawyer bag and the Evernew bags, I have to admit the Sawyer bag does indeed feel stronger! Phillipsart wrote: My setup has arrived and it works a treat, in the past week i have not had to remove my water bladder from my pack. Glad to hear its working well for you. I haven't used mine yet! 2.7 oz, $64 and comes with a 1L bottle collapsible. KANANGRABOYD wrote: I use a steripen freedom, and made a "adapter" from a large Gatorade bottle ( BPL have a post on it), and can UV 1LT at a time ( 2 x steripen UV lamp rounds). If my water is crap ( almost never happens), I use a contraption made of cutting off a Gatorade bottle about 3rd the way down, then stuffing it with aquarium filter wool. It will filter out pretty much any "macro" debris. Weighs nothing and can replace for about 5 cents. Don't know why so many people are against the Steripen - it is light, reliable and user friendly. Similar. SteriPen Traveler paired with laboratory filter paper (cheap and readily available on eBay and other sources) when needed. With CR123 rechargeable being so cheap these days (eBay, DX.com etc), the desire to only stay with AA models is diminished. The more compact size is good both for backpacking as well as general international travels. As for UV treatment. Well, it's one of the standard medical grade sterilisation techniques, so there's absolutely no reason not to trust it. Given the potentials of the virus vector, I have far more confidence with UV sterilisation than traditional filtering techniques. The only better is boiling it. Interesting read guys. I'm in the market for a water filter, never actually owned one which is quite limiting. Sawyer Squeeze does seem to be the ultimate - I didn't even know they existed until after reading this thread. I mostly like the idea that you can fill up a bag and filter it later, you're not bound to filtering the water while you're next to the creek. Make sure you get the SP129 as the SP131 was discontinued for reasons I'm sure Google will reveal. Highwater Filters were the cheapest I found, once postage was included. Does it ship to Australia? How much for postage? *edit* Just checked and no it can't be shipped to Aus. Highwater can do it for US$50.90 shipped - good price IMO.